I love this kitchen for several reasons and perhaps most importantly is that I don’t get to share anything from the homes that my husband and his company work in. He has a high end residential remodeling company and has been at it since college days and I have a fun anecdote to share today. He already had practical experience working summer jobs with his best friend’s father’s company, but he needed more knowledge of residential work. Eventually he went on to be a project manager on several large projects and then eventually started his own company. 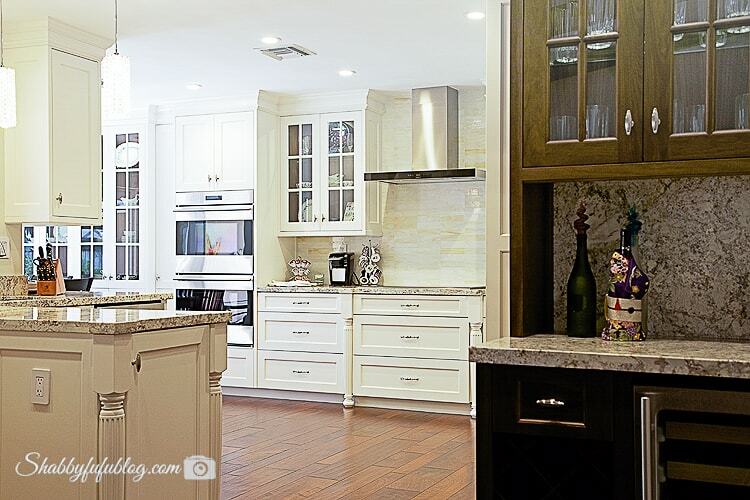 He’s sharing a few shots on this high end kitchen that you might want to consider if you are planning a kitchen renovation soon. He had the lights were turned on so the kitchen may not look white, but it is. When our oldest daughter was in elementary school she went along on a “take your daughter to work day”. The next day they had to share their experiences and when asked what her dad did for a living she said “he rides around in his truck all day and talks on the phone”! Haha…pretty much, but construction is so much more and not at all what they show you on TV in shows like Fixer-Upper and Flip or Flop. His clients for the most part are very private and with higher end or high profile lives they just don’t care to share on-line. I can be extremely discreet…but probably his most well know client to date has been The Rock/aka Dwayne Johnson. He left Miami a long time ago and has moved on to an enormous career as you know…but what a genuine guy! This home that I’m sharing today is actually one from our own neighborhood and of someone that we know pretty well and she allowed me to go in and take a few impromptu shots. The home was built in the 70’s and the kitchen was remodeled by my husband’s company in 1994. Previously the cabinets were white mica and the counters were a grey Avonite. It was nicely done and everything was still in great shape, but it was time for a change for this homeowner. Walls were taken out, tile floors removed, cabinets ripped out and everything reworked into what you see now. Sorry that I don’t have the “before” pics to share, but the phone pics that he took are not worthy of a share. Let’s just say…major improvement and it is now spacious and modern but with a classic look that will stay in style for years to come. 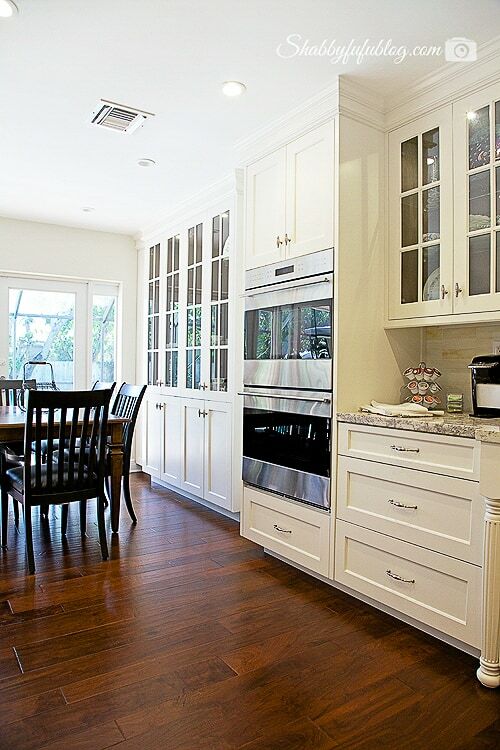 The cabinets were custom made and painted in Benjamin Moore White Dove satin finish. The floors are a beautiful pre-finished maple. 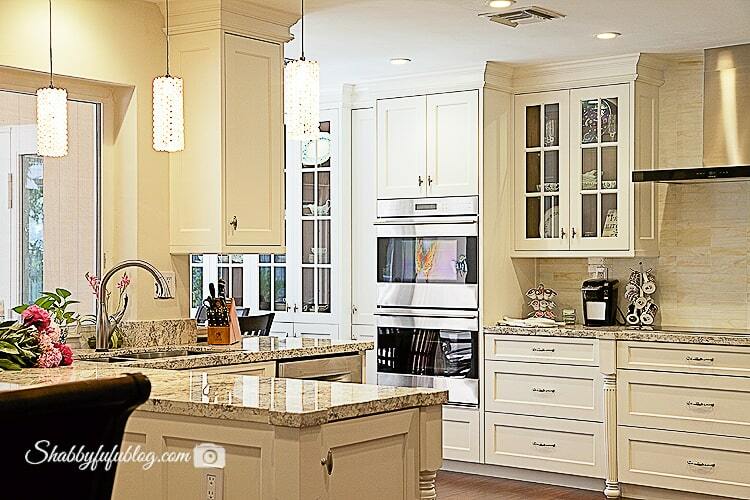 Appliances are: Subzero refrigerator, Wolf ovens, cooktop and range hood, Bosch dishwasher. 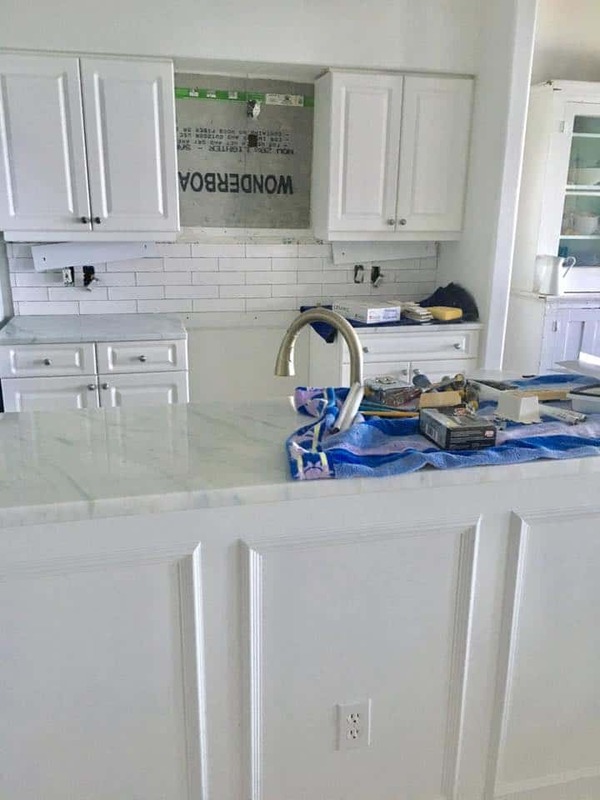 She chose a stainless steel sink and her counters are granite. 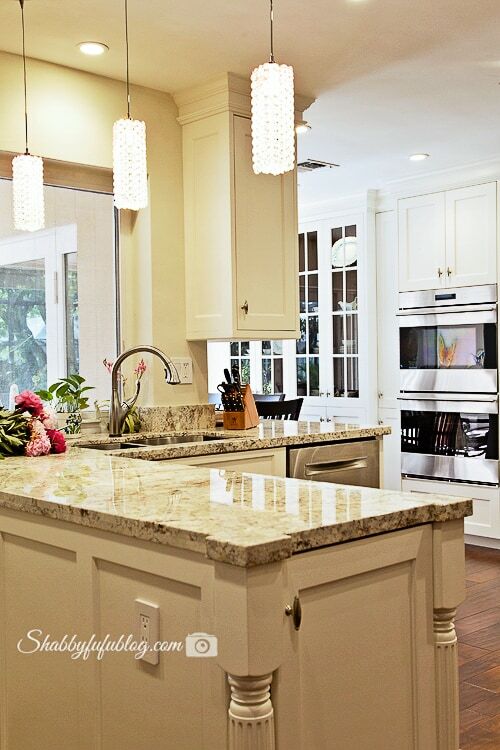 Kitchen backsplash is a cream color glass tile. The family room opens into the kitchen and you can see a bit of the bar cabinet that is a contrast with dark wood cabinets. 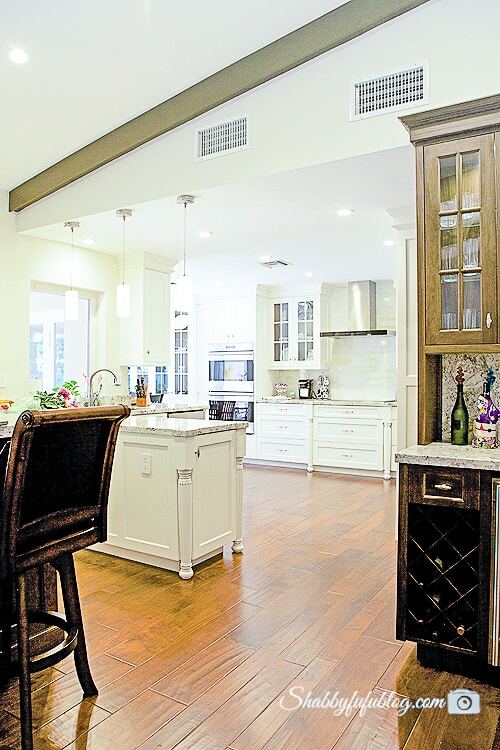 A wine fridge and wine rack and glass storage above comes in handy for entertaining. The view above looks towards the kitchen dining area and out towards the pool area. Since her pool is screened in and the patio has a large covered area, the room doesn’t let in a lot of light. Numerous high-hats were installed, and a trio of crystal hanging tubular lights over the working area. I left them on for this very quick and informal photo shoot. 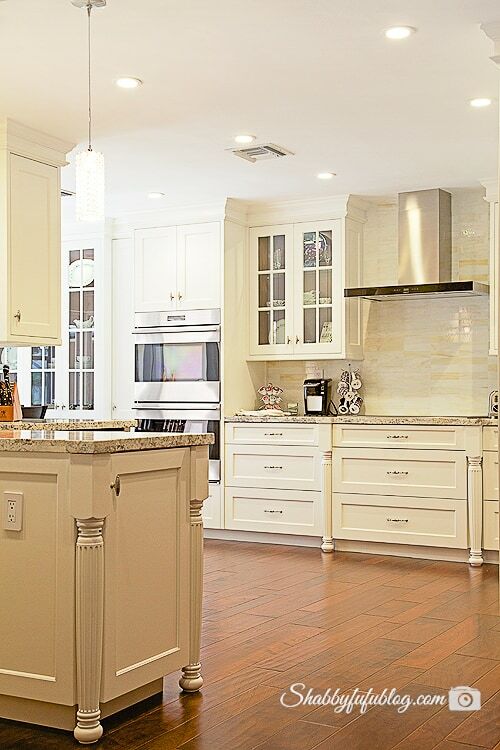 I love the darker wood floors with the white cabinets. There is no island in this kitchen, which may not be on trend, but the homeowner did not want one and the previous island was removed. 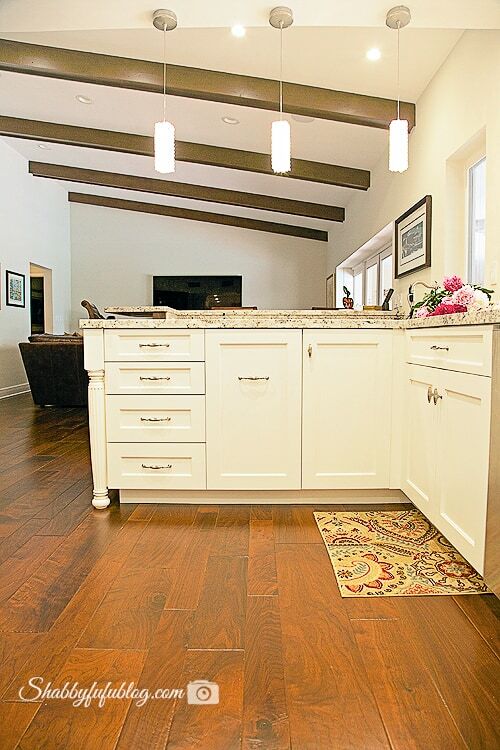 View is into the family room, where a happy family now has the kitchen of their dreams! Now here’s this…life un-staged captured on my iPhone yesterday. We are achieving this high end look at our beach home and that’s where we are right now. All on a ridiculously low budget. I hope that your interested in seeing more, as we move along and hope to finish up sometime next month! As always, your comments are treasured and so are you. If you are intested in seeing more kitchen tips and posts, just put the word KITCHEN into the search bar in the blog. 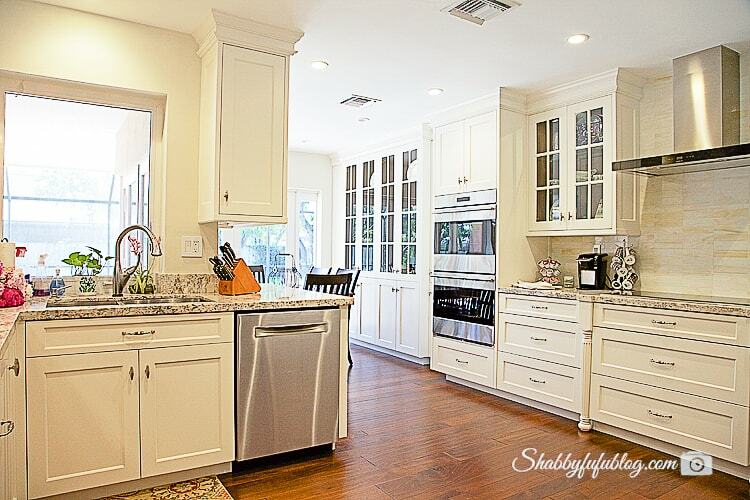 WOW – what a gorgeous kitchen. Tell your husband he can be a proud man…it's STUNNING!!! !